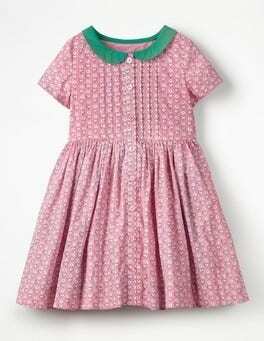 Fitted, fully lined, and with beautiful broderie anglais – could this cotton dress be any more elegant? We doubt it. The skirt finishes right above the knee, for a look that's both smart and flattering. Slip it on for dinner with friends and sunny-day garden parties with Pimms. 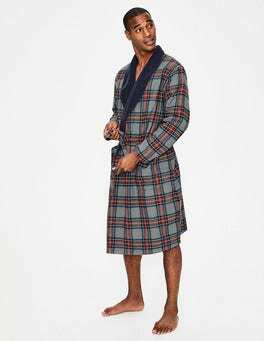 If you like relaxing in comfort, you'll love this dressing gown. It's made with brushed cotton and lined with sherpa fleece for maximum warmth and cosiness. The design also has handy patch pockets and a waist tie. Chilly mornings just became a smidge more bearable. 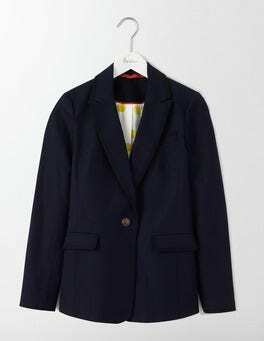 A good blazer sharpens up any outfit, whether it's jeans and trainers or a tea dress and flats. This one brings a touch of fun too, with playful colours, smart contrasts under the collar and beautifully designed buttons with a nautical theme. Shipshape! When the temperature soars, you can stay cool (in more ways than one) with this no-effort-required shift dress. Breathable cotton linen fabric keeps you comfortable, while the straight shift shape and turn-back sleeves make for thoroughly modern casual dressing. This classic empire-line dress in soft cotton sateen is designed to flatter and skim your curves in all the right places. Its wide neck is effortlessly elegant and, paired with some heels, it'll shift seamlessly from the 9-to-5 to a night on the tiles. …night away our vintage-style fit-and-flare dress. 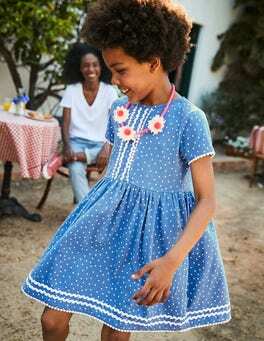 Crafted from soft cotton poplin and a hint of stretch, it features a sleeveless fitted bodice and princess seamsâ€”perfect for showing off sun-kissed limbs. The full skirt ends below the knee, so don't worry, you're set to get past any dress code. We have brought our sweatshirt dress back as you loved it so much. We have a range of tempting new options (including embroidery). The relaxed shape is comfortable in supersoft cotton and easy to wear – simply throw it on with pumps or trainers and go. 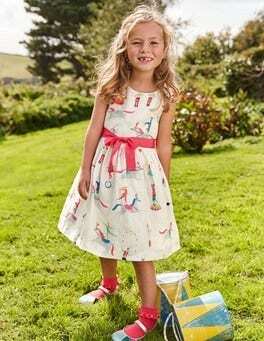 A full skirt, handy pockets, adjustable straps and buttons... We've put them all on our dungaree dress. But we believe it's what's on the inside that counts, so we've added a sprinkle of colour to the lining – now it's double the fun. The cosy comfort of a sweatshirt and a party-ready dress goes together as well as, say, stars and stripes. That’s just one of the options available in this cotton-mix long-sleeved style. Go for neon spots or a floral print for busy weekends and layer with leggings on cooler evenings. Have a holiday romance with our 60s-inspired dress. In an embroidered design, it's perfect for popping in your suitcase to wear with sandals by day and wedges by night. The shift shape is easy and there's a slip underneath to keep you covered and comfortable. 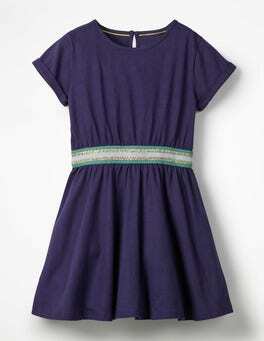 Last year you LOVED our Riviera dress, so we've bought it back with a longer, fuller skirt, so it's better than ever. With a flattering wait-tie belt and fit-and-flare shape, this elegant piece ticks all the right boxes. 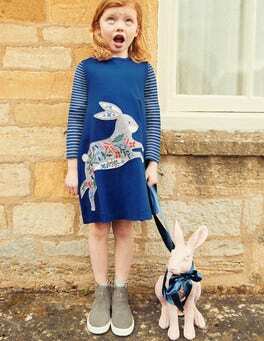 Join the animal friends on this cotton dress and fun is guaranteed – they've even brought their own toys and tassels. 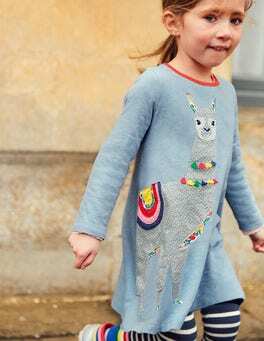 The dress is decorated with appliqué, 3D details and a contrast rib neck, while the full swing shape leaves plenty of room for running around. 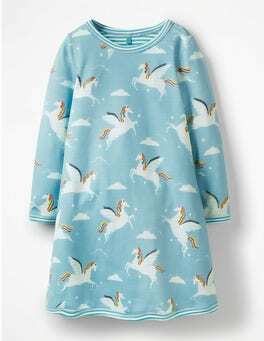 This 100% cotton dress has a trick up its sleeve. No, really – we made the care labels removable so it’s fully reversible. One side’s stripy and the other has a colourful print, so every occasion’s covered. Life’s just more fun inside out, isn't it? 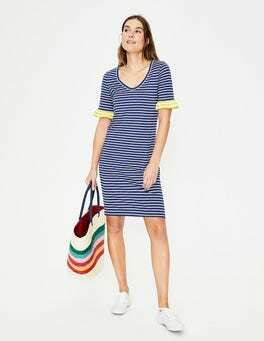 This soft cotton dress is so fun and easy to wear it might never come off. The full skirt was made for twirling, while the ruffles add a pretty twist. Wear with sparkly tights and leather boots for parties when there's a nip in the air. This delicate cotton dress was made to be worn with sand between your toes. The fully lined design has gentle gathers for a feminine shape, while the notch neck fastens when it's time to cover up. Ruffled sleeves, ladder trims and floral broderie make it a real holiday romance. 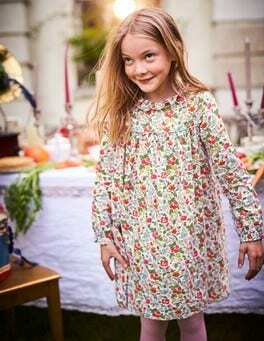 The pattern on this cotton broderie dress was exclusively designed in-house, inspired by harvest festival wreaths and leaves. The classic, feminine shape is made extra special with scalloped trims around the sleeves and hem. Pair with heels and a sleek clutch to really up the ante. 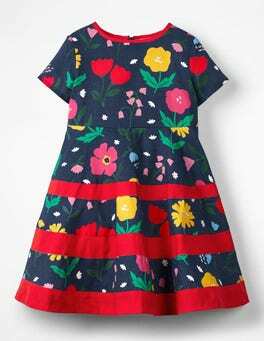 …around the garden in no time in this fully lined cotton tea dress. 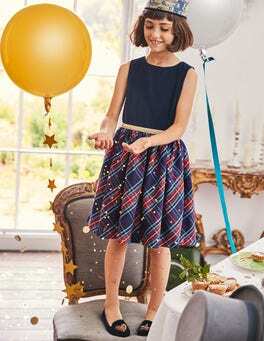 Decorated with a geometric bird print, pintuck detailing and a bright contrast collar, it's perfect for parties. The full skirt and gathers at the waist are twirltastic, while buttons down the front makes for super-easy dressing. You’ll love the shape of this occasion dress. The 100% cotton lace fabric (designed by us in house) is elegant and the skimming fit is flattering. Bell sleeves bring volume and head-turning trim detail complements the classic circle design. 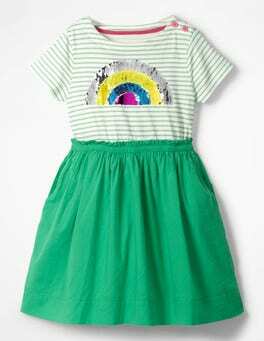 It's hard to resist twirling through sunny days in this full-skirted sleeveless dress, made from light cotton. 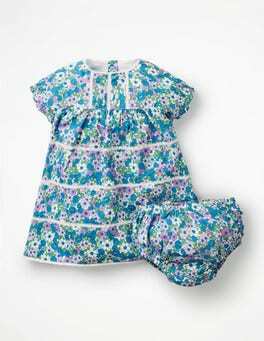 The smocking on the back panel makes it special enough for grown-up al fresco dinners too. No party is complete without a pretty little bow like the one on this delightful dress. Layers of underskirt and cotton voile with embroidered spots and scalloped edges are the icing on the (birthday) cake. Big, bold and bright – more is more with this floral skater dress. Crafted from pure cotton, the full skirt is perfect for swishing. Contrasting red panels and colourful printed flowers ensure it's the perfect weekend piece. This short-sleeved dress has great chuck-on-ability. And the unbelievably soft jersey cotton has all-day-every-day comfort. But the best bit? Check out that bedazzling colourful waistband with a glittery gold stripe. Shine bright. Shimmer on. Turn up at the party with a crowd of flamingos or shine bright with broderie stars in this spaghetti-strap dress. Crafted from breezy cotton and fully lined with adjustable straps, it'll stay comfortable for dancing on balmy nights. There are even pockets to stash an extra handful of sweets – shh. 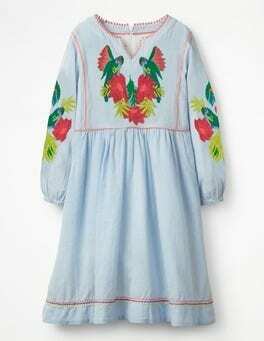 …this bohemian dress in light-as-a-feather cotton. The floaty style is decorated with intricate embroidery that we designed in-house. The unique design is paired with blouson sleeves and pretty tassels for an 'oh, I just threw this on' feel. This is no fling though – you'll love this dress forever.